How do you change the location of a play you have already written? In this guest post, playwright Tamara von Werthern talks about the implications of changing the location of her play The White Bike, which, after its’ London Premiere in 2017, has now made its’ way to Bournemouth for a production this Spring. 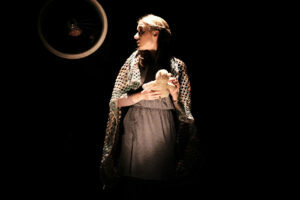 A year and a half ago, my play The White Bike premiered at The Space in East London. It was a long journey towards this production, which had begun with a couple of showcase performances at the Arcola Theatre in Hackney in 2010, and director Lily McLeish, myself and the amazing team working alongside us had our hands pretty full. In the run-up to the professional premiere of a play things can get so busy, that you can barely think about what might come afterwards. 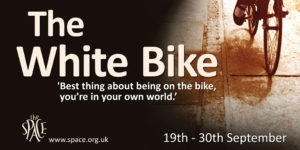 Poster for the original run of The White Bike which took place in 2017 at The Space. The piece was inspired by the true story of cyclist Eilidh Cairns, who was killed by a tipper truck as she cycled to work. 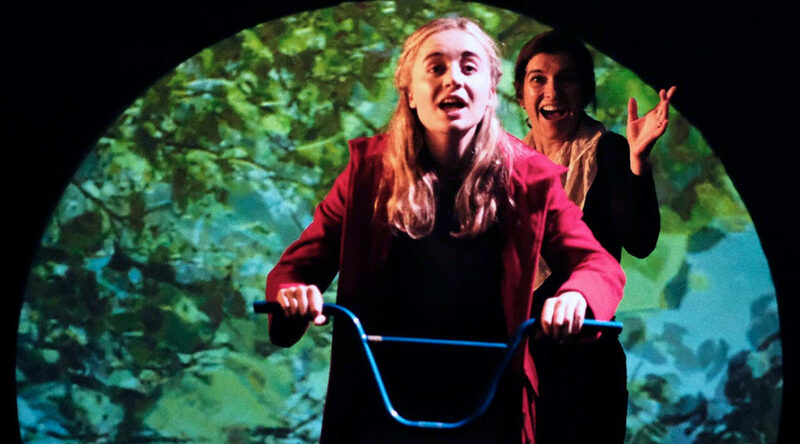 The play is both a call to arms to create safer environments on our roads for cycling and walking and a beautiful, fluid piece of theatre reflecting on loss and grief. It is set almost entirely on a bike, but the journey is interrupted constantly by other scenes set elsewhere. It was not easy to produce, but under Lily’s direction, the team which included stage designer Lucy Sierra, Complicite’s sound designer Pete Malkin, Frantic Assembly’s Simon Pittman, lighting designer Dan Saggars and video artist Ellie Thompson did an outstanding job and produced a show that skips along with a light touch and still manages to pull a sucker punch. 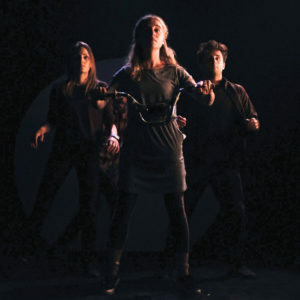 Josephine Starte was mesmerising in the lead as Isabelle and seamlessly supported by the ensemble cast who were sometimes lifting her into flight, sometimes giving her lip as a passing lorry driver, but all of them, Christopher Akrill, Helen Millar, Helen Stern and Liam Faik always on stage, making the piece sing as they switched between roles. As you can probably tell, I was quite awed by it all, and it made me rather protective of the play going out into the world after the last performance. Now, this is much easier said than done. The way the play is written, the bike journey central to it sparks images and ideas in your mind and Isabelle’s flashbacks and memories have to appear in a certain order as she is travelling, she remembers early childhood, teenage adulthood, meeting her future husband, getting married, the birth of her child – in short: her life flashes before her. So, while I was absolutely delighted when ImpAct Theatre in Bournemouth contacted me wanting to stage the amateur premiere of the play this coming April and May, I was also worried about how this would work practically. I was very impressed with the insight and passion with which Patricia Richardson, the director, approached the production. 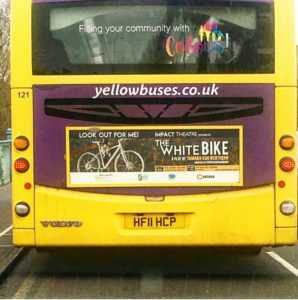 She managed to get Bournemouth Borough Council’s THINK BIKE campaign on board and secured advertising on the backs of busses, which is a stroke of genius, as that is where cyclists will be most likely to see the posters. She also put the word out through various outlets, including Sardines Magazine, and interest began to build. Speaking with her I could tell she was very serious about making the performance of my play relevant to the audience she was inviting to it. And that meant it would work much better in a local setting. Looking at the play again, I realised the extent of the changes that would have to be made. Could I just let them get on with this, and ask to see the changes before they started rehearsals? I could, but I also felt that I wanted to try out if it was possible for myself to do these rewrites. Patricia Richardson, the director, was very open to co-operation and grateful for my input. We agreed that she would find a local route that would have equivalent points of interest which could spark the relevant memories. She would walk that route herself and take pictures along the way, which she would then send to me, so I could see exactly what she was seeing when writing the replacement scenes. When I had written the original play, I had cycled the route several times with my notebook and jotted down what had caught my eye, so I was used to working in this way. What I hadn’t anticipated was that by seeing photos, I felt that I could really feel myself into the different locations, it felt as if I was there and this experience allowed me to expand on the original play. One of the new locations felt even more fitting to what I wanted to achieve with the scene set there than the London setting. In the original there is an important point in the journey when Isabelle turns off a main road and joins the canal path. The change in sound-scape and atmosphere was remarkable and I wanted to create a feeling of peace as well as freedom. The cleaner air, the lack of danger from passing vehicles, as well as what she sees: the houseboats, the ducks, the water rippling, all contribute to this. In Bournemouth, there is no canal, but, in many ways even better, there’s the open sea, and a marked cycle path leading along the promenade. I have always loved being by the sea, and to me this is the ultimate feeling of freedom, it allows your mind to open up in a wonderful way. So rewriting the canal scene by the sea made me very happy. 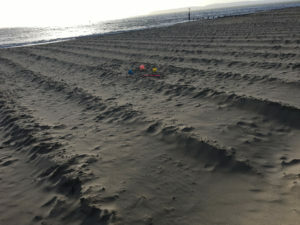 It was important to have the pictures though, so that I didn’t ‘invent’ a seaside that I remembered from elsewhere, and it was incredibly powerful to see details such as a child’s bucket and spade that were left behind on the sand. Over a few weeks of photos being sent one way and snippets the other we had, bit by bit, replaced all the locations and made the play local to Bournemouth. I was really happy both with the process and the result. There was one last challenge to overcome though: One scene is set in a club which then leads to a description of the different London-based places Isabelle went out in, as her taste in music changes and she grows up. Having lived in London myself from the age of twenty, I could piece that together fairly easily, but I had no idea of how to approach this with a city where I had never lived. Patricia Richardson was also not able to provide me with ideas of her own in this particular field. But luckily, I remembered that my sister-in-law had lived in Bournemouth around the time the scene was set, and her partner was involved in the Indie music scene there. I asked for his help and was not disappointed – he sent me an in-depth record of where she could have gone at which age, which pubs would be good to start a pub-crawl in and where you could go to dance. He even provided some authentic details of the places where everyone was smuggling vodka in to top up their drinks. Just the inside knowledge I needed to give the scene local colour and make it believable. So, would I do it again? Yes, I would. I do believe strongly in the importance of specificity when it comes to setting, but in the same way that a script is really just the blueprint to a production, each new production team has to be given the chance to make the piece their own and for it to be placed where it is played, if that serves the story line. I have booked my train tickets and can’t wait to see the show at the Shelley Theatre in May. It feels as if somehow my journey with the play has come full circle now, and I am so pleased that this story which is so important to me, is being told again, by other people, somewhere else. With this production at the Layard Theatre 16-17 April and then The Shelley Theatre 30 April – 1 May, the play’s onward journey has begun. On 3 – 5 May it will also be shown at the Scaffold Theatre at Bodens Performing Arts School in London (no rewrites needed!) and I hope many more companies will pick it up after this.